Friday, June 5 and Saturday, June 6, 2015: Veterans Memorial Field @ UW-La Crosse. Released by WISTCA September 16, 2015. 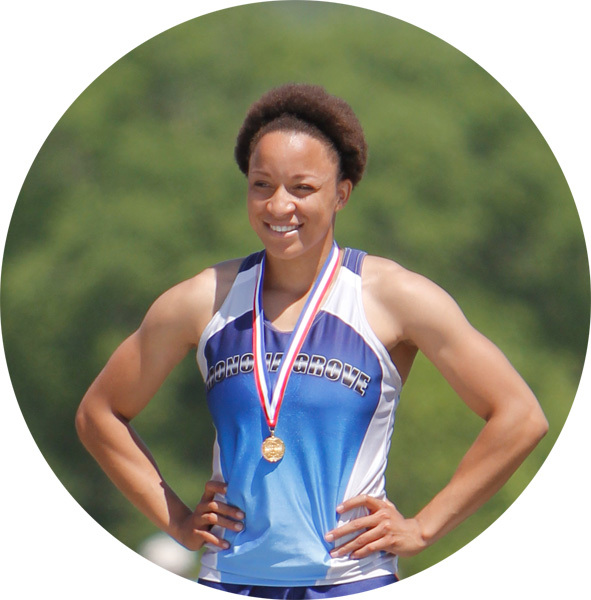 To qualify for the Wisconsin Track Coaches Association All-State Team, athletes had to finish in the top six for all three divisions combined in the finals at the 2015 WIAA State Meet. 100m Dash: 1. Gabby Beauvais SR Monona Grove 12.31; 2. Jackie Baldwin SR Kenosha Bradford 12.42; 3. Tanesha Davis JR Racine Horlk 12.70; 4. Nadia Williams JR Mount Horeb 12.71; 5. Kaitlyn Jackson JR Whitefish Bay 12.72; 6. Maddy Pietz FR Wittenberg-Birnamwood 12.80. 200m Dash: 1. Gabby Beauvais SR Monona Grove 24.32; 2. Jackie Baldwin SR Kenosha Bradford 24.77; 3. Kaitlyn Jackson JR Whitefish Bay 25.12; 4. Alyssa Faucett JR Wausau West 25.47; 5. Tore Washa SR La Crosse Logan 25.59; 6. Grace Hartman SO WI Rapids 25.70. 800m Run: 1. Cami Davre SO Whitefish Bay 2:09.22; 2. Allison Johnson SR Clintonville 2:12.72; 3. Emma Langer JR Waukesha West 2:12.87; 4. Bobbi Patrick SR Middleton 2:12.90; 5. Brittany Davis SR Benton/Scales Mound/Shullsburg 2:13.11; 6. Mary Hanson SR Dodge/Min Pt 2:13.23. 1600m Run: 1. Amy Davis SR Edgewood 4:53.17; 2. Alicia Monson JR Amery 4:55.32; 3. Cami Davre SO Whitefish Bay 4:56.12; 4. Aubrey Roberts JR Eau Clr Mem 4:56.84; 5. Anne Frisbie SR River Falls 4:59.00; 6. Amanda Johnson SR Racine Park 5:00.72. 3200m Run: 1. Alicia Monson JR Amery 10:26.86; 2. Aubrey Roberts JR Eau Claire Memorial 10:42.76; 3. Amy Davis SR Edgewood 10:46.21; 4. Anne Frisbie SR River Falls 10:46.86; 5. Brenda Hernandez SR Beloit Memorial 10:52.13; 6. Annie Hughes SO Arrowhead 10:52.90. 100m High Hurdles: 1. Danielle Kohlwey SR Holmen 14.85; 2. Lauren Smith JR Middleton 15.10; 3. Meghan Pingel JR Lakeside 15.11; 4. Kari Schneiss SR Kettle Moraine Lutheran 15.32; 5. Eva Laun-Smith SO Beloit Memorial 15.37; 6. Kayla Vandehey JR Kimberly 15.52. 300m Low Hurdles: 1. Danielle Kohlwey SR Holmen 44.44; 2. Claire Birk JR Hamilton 44.93; 3. Mikaela Grant JR Jefferson 45.03; 4. Faith Lubner SO Reedsville 45.05; 5. Pamela Fuchsel SR Aquinas 45.10; 6. Hannah Mertens SR Hartford 45.22. 4x100 Relay: 1. Wauwatosa West 48.39 (Azya McLin JR, Mercy Ndon JR, Brianna Horton JR, Cheri'A Adams SO)); 2. Kenosha Bradford 48.42 (Faith Taylor SR, Alexus Nelson JR, Icy Perry FR, Madison Marko JR); 3. Wisconsin Rapids Lincoln 48.77 (Tia Dorshorst FR, Grace Hartman SO, Elizabeth Keena SO, Dayna Schultz JR); 4. Middleton 48.82 (Olivia Roberts JR, Hanna Docter SR, Hanne Andersen-Smith JR, Lauren Smith JR); 5. Germantown 48.85 (Rosalie Campbell JR, Erika Bethhauser SR, Tatum Gallenberger SO, Kenzie Schmitz SO); 6 Hamilton 48.92 (Victoria Johnstone SO, Taylor Klug JR, Katlynn Mushall SR, Mariana Feudner SO). 4x200: Relay 1. Kenosha Bradford 1:39.40 (Jackie Baldwin SR, Alexus Nelson JR, Faith Taylor SR, Madison Marko JR); 2. Middleton 1:42.27 (Hailee Milton JR, Lauren Smith JR, Hanne Andersen-Smith JR, Hanna Docter SR); 3. Brookfield East 1:42.69 (Jasmine Watson SR, Sierra Fischer JR, Allie Bullen JR, Emily Breider FR); 4. Germantown 1:42.86 (Rosalie Campbell JR, Tatum Gallenberger SO, Erika Bethhauser SR, Kenzie Schmitz SO); 5 Wauwatosa West 1:42.91. (Azya McLin JR, Mercy Ndon JR, Brianna Horton JR, Cheri'A Adams SO); 6. Lakeside Lutheran 1:43.28 (Sami Huebner SR, Amber Rowoldt FR, Lydia Ulrich JR, Meghan Pingel JR). 4x400 Relay: 1. Hamilton 3:55.75 (Taylor Klug JR, Chelsea Parker SO, Mariana Feudner SO, Bianca Stubler SO); 2. Waukesha West 3:56.37 (Maddie Frey FR, Samantha Hanson SO, Becca Langer FR, Emma Langer JR; 3. Middleton 3:56.68 (Hanna Docter SR, Emily Zeker SR, Rachel Wians SR, Bobbi Patrick SR); 4. Oregon 3:57.06 (Maddie Le Brun JR, Samantha Girard JR, Alexis Jackson FR, Riley Rosemeyer SR); 5. Germantown 3:57.14 (Rosalie Campbell JR, Tatum Gallenberger SO, Kenzie Schmitz SO, Alyssa Goesch SO); 6. De Pere 3:58.31. (Margaret Miller SR, Kylie Arett JR, Lindsey Mirkes SO, Grace Matzke FR). 4x800 Relay: 1. Whitefish Bay 9:14.12 (Reilly Koch SR, Josie Helf FR, Kylee Kennedy JR, Cami Davre SO); 2. Waukesha West 9:15.73 (Samantha Hanson SO, Megan Bur SR, Becca Langer FR, Emma Langer JR; 3. Middleton 9:16.52 (Emily Zeker SR, Rachel Wians SR, Samantha Valentine JR, Bobbi Patrick SR); 4. Arrowhead 9:21.41. (Peyton Wesley JR, Morgan Hobbs SO, Kat Kredell SR, Kayla Vogt FR); 5. Bay Port 9:24.86 (Nicole Hohn SR, Sophia Thibert FR, Hattie Plumb JR, Madeline Re SO); 6. Chippewa Falls 9:25.13 (Tyana Loiselle JR, Kathryn Webb JR, Arica Swift FR, Elizabeth Daniels SR). High Jump: 1. Khadiya Hollingsworth SR Brkfield Est 5-08.00; 2. Tierney Lindner SR Sun Prairie 5-07.00; 3. Brooke Blazei SO Martin Luther 5-05.00; 4. Hope Schneider SO East Troy 5-05.00; 5. Sydney Collins JR Badger 5-04.00; 5. Lily Engel SO Eau Claire Memorial 5-04.00; 5. Julia Evans SR Platteville 5-04.00; 5. Jael Harris SO Oshkosh Nort 5-04.00; 5. Natisha Hiedeman SR GB Southwst 5-04.00; 5. Breanne Marchan JR Wild Rose 5-04.00; 5. Vashti Nwagbaroacha SR Pius XI 5-04.00; 5. Lizz Ottusch SR Kettle Moran 5-04.00; 5. Emily Scott FR Lakeland 5-04.00. Pole Vault: 1. Rayce Albino SR New Berlin W 12-03.00; 2. Kylie Swiekatowski JR De Pere 12-00.00; 3. Shaelyn Opichka JR De Pere 11-06.00; 4. Brielle Buechler SO Wrightstown 11-03.00; 5. Tommie Brenner SR Reedsburg Ar 11-00.00; 5. Brittany Ehlen SR Burlington 11-00.00; 5. Emily Heil SR Marathon 11-00.00; 5. Sheridan Michaud JR GB Preble 11-00.00; 5. Erin Neveau JR Oshkosh Nort 11-00.00; 5. Miranda Severin SR Eau Clr Mem 11-00.00; 5. Linse Wilbur SO Westby 11-00.00. Long Jump: 1. Jade Nolan SR Milw.MadisonUniv 19-08.50; 2. Angel Malone SR Milw Riversd 19-02.50; 3. Gabby Beauvais SR Monona Grove 19-01.00; 4. Nadia Williams JR Mount Horeb 18-09.25; 5. Natisha Hiedeman SR GB Southwst 18-07.50; 6. Mikaela Grant JR Jefferson 18-02.25; 6. Faith Lubner SO Reedsville 18-02.25. Triple Jump: 1. Natisha Hiedeman SR GB Southwst 38-07.50; 2. Monique Felix SR Sheboygan No 38-01.75; 3. Sydney Otto JR De Pere 38-00.50; 4. Eva Laun-Smith SO Beloit Memorial 38-00.00; 5. Betsy Schreier SR Cashton 37-10.00; 6. Maddie Nelson JR Hudson 37-04.50. Shot Put: 1. Sam Noennig JR Hartford 44-05.50; 2. Tess Keyzers SO Little Chute 44-00.00; 3. Erin Dunning SO Ashwaubenon 43-11.50; 4. Kris Lindow JR Ashwaubenon 43-03.00; 5. Katie Taylor JR Hayward 42-08.50; 6. Isabella Samuels SR GB Preble 42-03.25. Discus: 1. Sam Noennig JR Hartford 161-06; 2. Josie Schaefer SO Baraboo 155-01; 3. Annalese Lamke SR Gale-Ettrick-Tre 140-04; 4. Karly Murphy JR River Falls 139-02; 5. Emily LaCount SR Kimberly 138-09; 6. Katie Taylor JR Hayward 135-08. 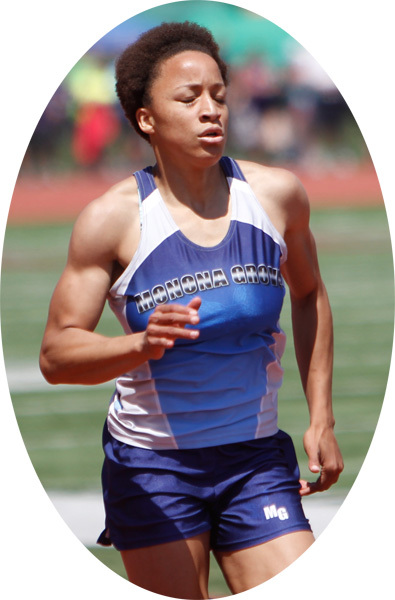 2015 Monona Grove graduate Gabby Beauvais has been named Athlete of the Year by WISTCA. Beauvais scored all of Monona Grove's points at the WIAA State Meet as Monona Grove finished tied for third place in D1. Beauvais placed third in the D1 LJ with a distance of 19' 01.00. She was one of three athletes that broke the old record of 18' 11.50. Gabby Beauvais was dominating in the dash events at the 2015 WIAA State Meet. 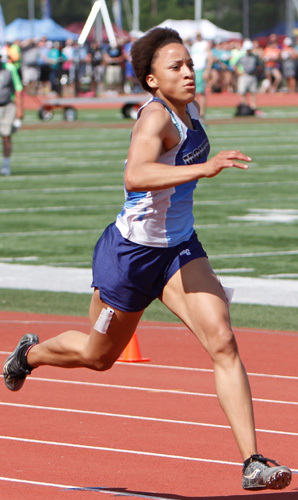 On Saturday she began the day with a Gold Medal in the 100m dash event with a time of 12.31. At the end of the meet she also placed first in the 200m dash with a time of 24.32. Midway through the meet Beauvais set a D1 State Record in the 400m dash. She pulled away from a talented field and posted a record breaking time of 54.82. Above left: 100m dash finals. Above center: 400m dash finals. Above right: 200m dash finals. Below: Long jump sequence at the 2015 Dana Waddell Marshall Invitational.